At Eagle Rivershore Dental our number one priority is your dental health. Our second priority is your comfort. That comfort includes the comfort of affordable dental care. Many of our patients have dental insurance coverage that helps reduce costs. But what about our patients who do NOT have Dental Insurance? We provide all our patients with the best dental care possible whether or not they have dental insurance. But to help our patients who do NOT have insurance benefits we have created our Patient Loyalty Program. 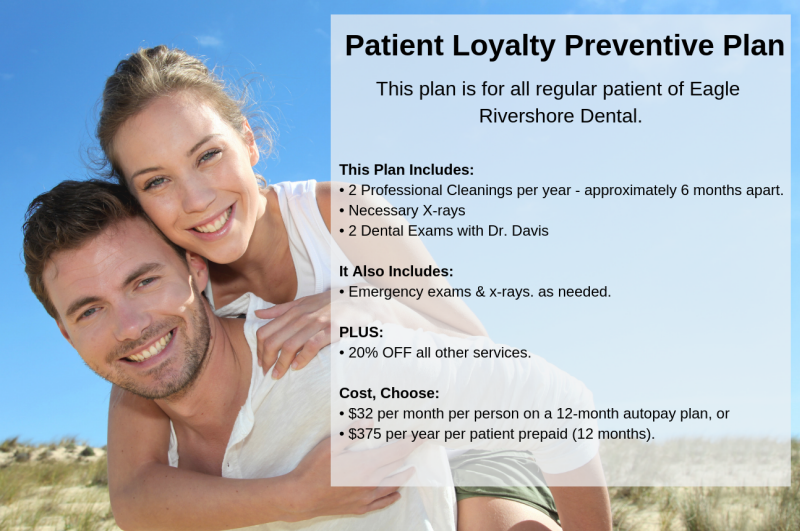 Our Patient Loyalty Program is not dental insurance. But it is designed to give you the convenience of predictable costs for regular dental maintenance as well as cost savings of up to 20% for all other restorative or even cosmetic care. 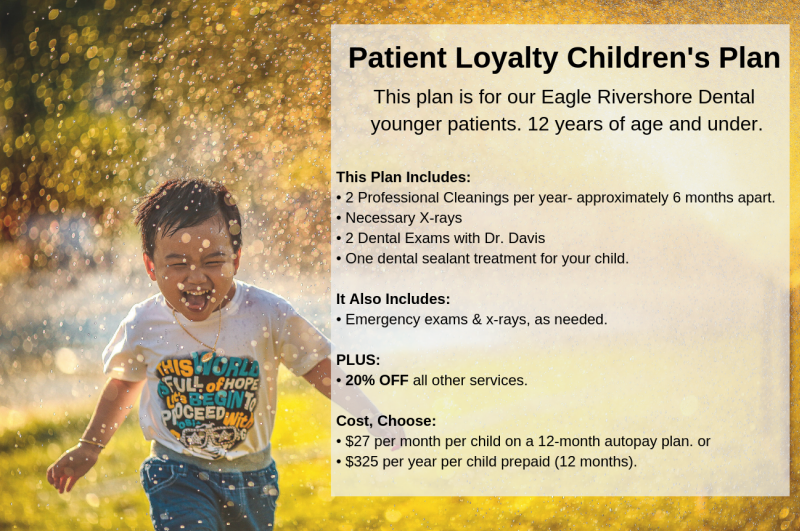 Sign-Up for an Eagle Rivershore Dental Patent Loyalty plan is easy. Simply complete the Patient Loyalty form and pay for the plan. Or, if you select the Autopay option simply make the first month’s payment. Benefits start immediately. If you'd like to make an appointment please call us or click here. 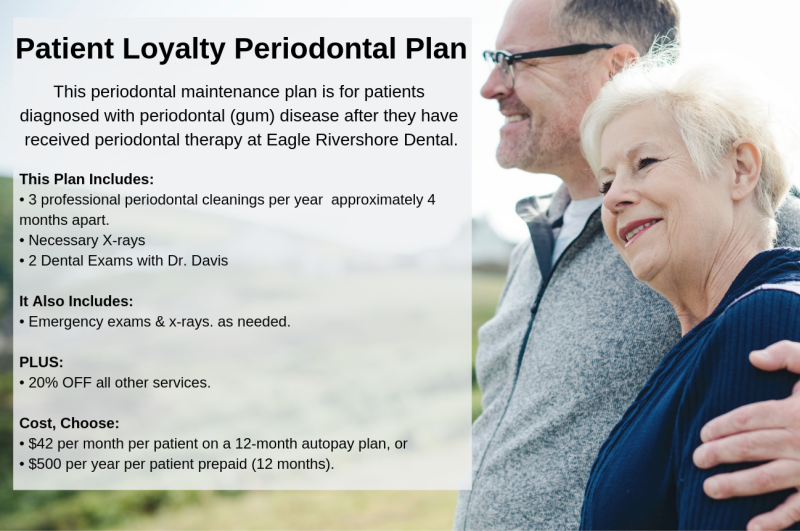 The Eagle Rivershore Dental Patient Loyalty Program is not dental insurance and is only available to patients who do NOT have dental insurance. These plans are in-house plans for the convenience of our patients and are not transferable to any other practice. They are also not redeemable should you move or leave the practice. Please call us with any questions and to learn more. Benefits not used in the covered year (such as a professional cleaning) by the patient are not redeemable for reimbursement or transferable to the following year.